If you are looking for activities for your boys to do you have come to the right place. Here at Brain Power Boy we are all about raising boys who love to learn and finding the right activities for boys to do is a big part of that focus. The right activity for your boy is the one that will get him learning in a way that is meaningful and also fun. You do not need to spend days on the Internet trying to find the good stuff! That is where we come in. We love to find very cool activities for boys and we will keep a running list of them here on this page. Bookmark it, save it in Evernote, or Pin this page and you will always have something new for you and your boys to do. Getting boys learning is easy when you find activities that are fun and that they are interested in. If your boy is into computers try Coding! This is an ongoing series of articles and resources on coding. Check out some fun Leonardo da Vinci activities. I shouldn’t play favorites, but this is one of my top picks if your boy likes robots. Huge Pirate resource guide with books, games, weapons, ships, navigation and maps + this is an ongoing series. Dig This Dinosaur Fossils Resource Guide 🙂 Plenty of ideas to keep your dino lover of any age happy. Have fun with Rube Goldberg Machines. These are a hoot and a lot of learning happens while messing around with them. Games, DIY, videos and much more. Shark Activities That Will Blow You Out of the Water – for shark week and beyond. 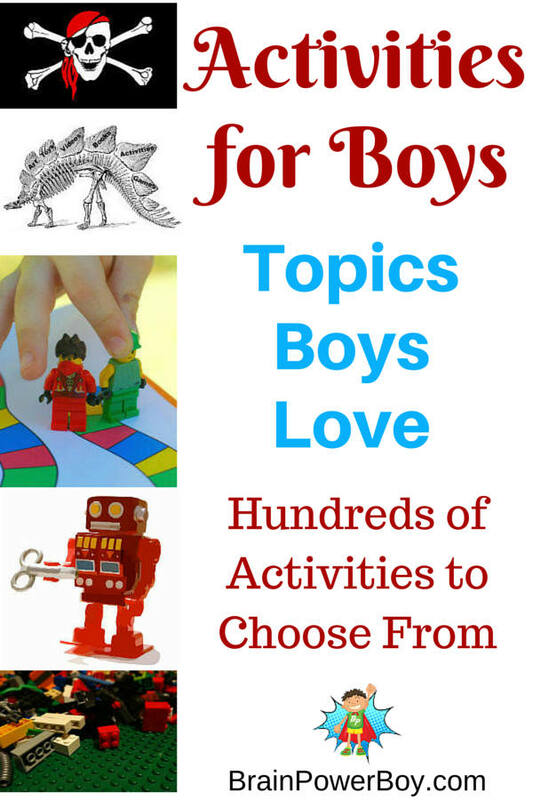 Popular Activities Boys Will Love – top activities from our site. Games are seriously one of our favorite ways of learning. These LEGO Math Games are super easy to set up and a lot of fun for boys to play. LEGO Learning Math Games Part 2 new fun ideas to try. Super fun math games to play. Warning! You might learn something while playing. Play Cards, Learn Math, Have Fun. Fun cards games to play plus a can’t be missed math sculpture made out of playing cards. See our Really Fun Math Games page as well for more ideas. Play these Balloon Archery Games for some outdoor enjoyment. Free Printable Sight Word Game with LEGO minifigs for markers. Sight Word Games Boys Will Go For! 7 fun games they will enjoy playing. Very hands-on. Action Sight Word Games for Boys Who Have to Move! Great for kinesthetic learners. Wow! Free Star Wars Printable Sight Word Games Whoop! All Star Wars sight word games. 7 Sight Word Games to Get Boys On the Road to Reading Car and truck sight word games. Arrr! Play These Fun Pirate Sight Word Games! Perfect for pirate fans! Dinosaur Free Printable Sight Word Game with plenty of hands-on action. Robot lovers will enjoy the Printable Robot Memory Game! Cute Forest Animal Memory Game. Great for younger boys and animal lovers. A lot of Free Printable Games with Boy Appeal. You are sure to find something fun to play. Free Printable Forest Food Chain Game. Easy game to learn about food chains and webs. see also memory games and sight word games for more free printable games. If you boy really likes playing video games why not try this resource. He will learn a ton. Make Your Own Video Games. Create your own LEGO Minifig and Play 10 The LEGO Movie Games. LEGO Designs on Brain Power Boy Fun ideas and directions for building with LEGO. My husband is a professional magician and is sharing easy magic tricks done with household materials. Go to our Awesome Perler Bead Pattern Projects for Perler patterns and designs on boy topics. Lightsabers, Jedi, Yoda, Wookies and more–Star Wars is a favorite! May the Fourth Be With You has some great Star Wars books and activities. Star Wars Perler Bead Pattern R2-D2 Make your own R2-D2 out of perler beads. See also Holiday and Seasonal Activities, Sensory Bin Activities for Boys, and sight word games. Have you tried sensory bins for your boys? They are easy to put together and boys really learn a lot while playing with them. Sensory Bins for Boys Find out how boys learn while playing with sensory bins, and see 10 bins chosen for their boy appeal. LEGO Slime Sensory Bins LEGO + Slime = Awesome! Try these sensory bins that will certainly keep your boy engaged for a long time. Star Wars LEGO, Minifig LEGO, LEGO Lava and more. Winter Treasure Hunt Bin A simple treasure hunt preschool bin. 9 Dinosaur Activities for Toddlers and Their Big Brothers is perfect for multi-age play. 50+ Awesome Ideas for Unplugged Play – you will find so many good ideas here. 25 Hands-on Spring Break Activities Boys Will Go For – these are perfect for school breaks or if you need to mix things up a bit in your homeschool week. Free Comic Book Day Tips for navigating the day and previews for comic books. The Art of the Brick is a wonderful LEGO exhibit. Pictures and information. Free Museum Day. Tips and dates for free tickets to see a big selection of museums. Find activities for all of the seasons as well as Holiday fun right here. Make a Fun Rocket Flyer – great for any patriotic holiday. Easter Eggs for Boys to Make. There are Star Wars, Minion, Volcano, dinosaur, Super Mario Bros, LEGO and more. Easter LEGO Designs. Make two bunnies and a chick our of LEGO. Easter Egg Drawing Challenge. Tips for a fun and easy drawing activity for Easter. DIY Valentines for boys to make. Minecraft, LEGO, dinosaurs, cars, and some printables you can use to make your own Valentines as well. Fun Summer Activities for Boys. Over 150 ideas! Most of them are totally free. Geek Snowflakes! Make LEGO, Star Wars, Dr. Who, Batman & Minecraft snowflakes. Video instructions for folding and cutting, plus tips for making these awesome snowflakes. We had a total blast with these. We love LEGO and Christmas. Here are some fun DIY LEGO Christmas builds with instructions to try. DIY Christmas Ornaments for Boys to Make has a bunch of really neat ornaments including Star Wars, Minion, Elmo, puppies, penguins and some very cool LEGO ornaments too. Do you get our newsletter? It is a great way to keep up with the new posts that are coming out. Keep up-to-date on all that we share here on Brain Power Boy and find fun things to do with your boys.